An early and key feature of Alzheimer’s disease is loss of cholinergic basal forebrain neurons. 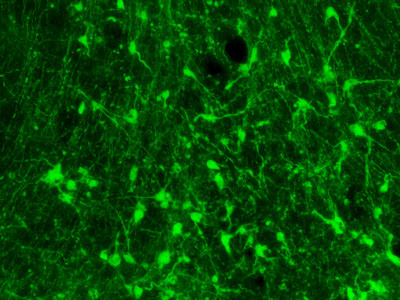 These neurons play a critical role in learning and memory. What triggers these cells to die remains unknown and forms the basis of our research. We do know that they are dying via a process known as apoptosis or programmed cell death. Apoptosis is a mode of cell death in which the cell plays an active role in its own demise. Apoptosis occurs in all multicellular organisms and happens when a cell gets to the end of its life. Apoptosis differs from necrotic cell death as the disposal of cellular debris does not damage the organism and is recycled to be used in future biochemical processes. In the nervous system this process is crucial to the correct developmental maturation of the brain. You are born with an incredible number of neurons that are undergoing a battle of survival of fittest. Only cells that wire up correctly and integrate into functional circuitry survive. If you don’t use it you lose it. Cells that fail to successfully integrate into the neural circuitry don’t receive critical growth factors and undergo cell suicide or apoptosis. This developmental pruning is a crucial process in the fine-tuning of the brain. A second great wave a neural rewiring and apoptosis occurs during adolescence when the cortex fully integrates itself with lower forebrain emotional centers. Neural apoptosis occurs not only in development, but also in pathophysiological states such as stroke, glutamate toxicity, and β-amyloid toxicity. 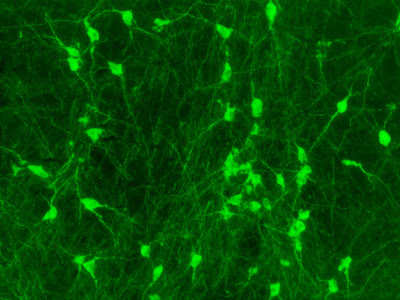 The focus of our research is understanding the mechanism by which β-amyloid (the pathological hall mark of Alzheimer’s disease) triggers apoptosis in cholinergic basal forebrain neurons. The series of images inspiring Melody’s embroideries are taken from images of cholinergic basal forebrain neurons undergoing apoptosis. 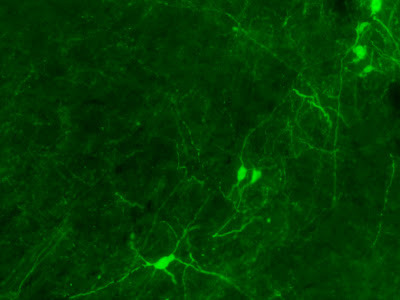 The process used to visualize these neurons is immunohistochemistry. Look out for my next blog where I will attempt to explain the process of attaching fluorescent antibodies to specific proteins to visualize the brain. "A second great wave of neural rewiring and apoptosis occurs during adolescence when the cortex fully integrates itself with lower forebrain emotional centers." Which explains a lot about my 15-year-old. LOL Melody, you could be right!